Seriously, what the heck is “Thai barbecue” anyway? Like a lot of the things that end up on our truck, Thai barbecue was just a part of my imagination that screamed, “We need to create a Thai-influenced barbecue sauce with fresh lemongrass, chilies, Thai basil, lime juice, and galangal!” I mean, it sounded really fun to me one night at 3:00 a.m. when I was dreaming up our special for the week, and it turned out to be one of our most popular specials in spring 2013. By the time I got to making one for myself, we were sold out of the seitan ribs; so I had the sandwich with baked tempeh in place of the ribs. I liked it so much that way that I added it full time to our menu. Now it’s one of my favorite things to eat from our truck, and it works fantastically on our gluten-free millet-flax bread. These seitan “ribs” can be used in many ways for other dishes, and they freeze well, if carefully wrapped, for up to two months. They really need the final sauce on them to be awesome, so resist the temptation to eat them when they are fried but not yet finished in the Thai barbecue sauce. Promise? Roast the peanuts: Preheat the oven to 350°F. Lightly oil a rimmed baking sheet and line with parchment paper. In a mixing bowl, thoroughly combine the peanuts, agave nectar, vinegar, chipotle powder, paprika, ginger, olive oil, and salt. Evenly spread the coated nuts onto the baking sheet and bake for 8 minutes, or until the nuts are roasted and mostly dry. Use immediately, or store at room temperature in an airtight container for up to 3 weeks. Make the Thai barbecue sauce: Combine the lime juice, lemongrass, galangal, basil, cilantro, habanero, red pepper flakes, tamari, and coriander in a small saucepan over medium heat. Bring the ingredients to a boil, then cover the pot, turn off the heat, and allow the mixture to cool for 20 minutes. Pour the mixture into a blender with the tomato paste and olive oil. Blend on high for 40 seconds to create a mostly smooth sauce. Use immediately, or refrigerate in an airtight container for up to 4 days, or freeze for up to a month. Make the seitan ribs: In a food processor, purée the tofu fully. Add the tamari, onion, celery, carrot, and garlic, and process until smooth. In a medium bowl, combine the wheat gluten, paprika, cumin, curry paste, and coriander. Mix in the blended tofu and vegetables, kneading for a minute or so to form a thoroughly combined dough. Fry the ribs: Heat the canola oil to approximately 355°F in a skillet or pan with high sides. On a cutting board, press the dough into a rectangle approximately 3½ by 7 inches. Slice the rectangle into 14 to16 thin strips. In two batches, fry the strips of dough in the hot oil, turning as needed to thoroughly brown the outsides, about 5 minutes total. Remove the fried strips to a paper-towel-lined plate just long enough to soak up any residual oil. Place the seitan ribs in a pan over high heat. Once the seitan starts to sizzle, pour on 1 cup of the Thai barbecue sauce. Toss the seitan in the sauce while it cooks for about 2 minutes, or until the seitan is coated and seared thoroughly. Assemble the sandwiches: Heat a pan or griddle over medium heat. Cut each baguette portion in half lengthwise. Toast the baguettes in the pan, cut side down. Spread 2 to 3 tablespoons of Sriracha mayonnaise on each baguette half. 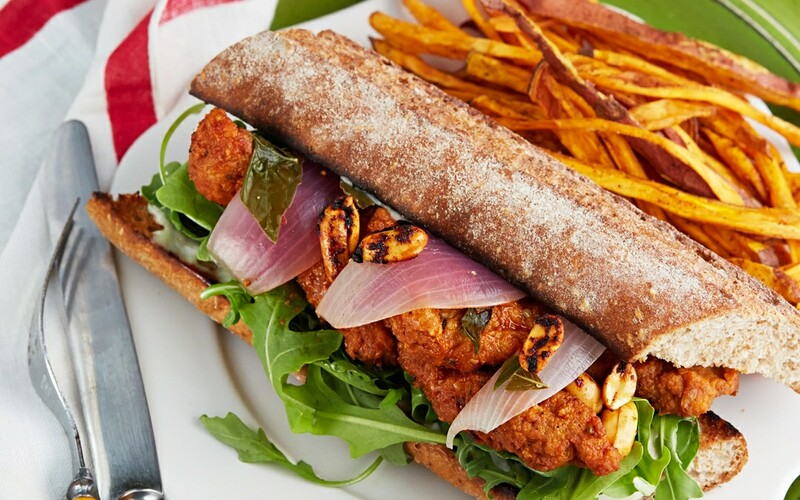 Place ¾ cup of the arugula on each bottom half of baguette, followed by 5 or 6 pieces of the seitan ribs. Sprinkle with about ¼ cup of the pickled onions, including some of the basil, and top with a liberal sprinkle of the roasted peanuts. Cover with the top half of baguette. Sriracha is a Vietnamese-Cambodian–inspired hot sauce with an addictive chili flavor and lots of bite. This mayonnaise is a great way to turn up the heat on Asian-style sandwiches such as bánh mì, on our Thai Barbecue Seitan Ribs, or on the Chinese-style steamed buns in our Bangin’ Bao. Combine the mayonnaise, Sriracha, and evaporated cane juice in a medium bowl. Store in an airtight container in the refrigerator for up to 3 weeks.